Listening: My boys just pulled it off with a walk-off win! Woo hoo! Loving: I love my job...I love my students...but I also love my summers 'off.' I'm so ready for a break to rejuvenate and recharge. 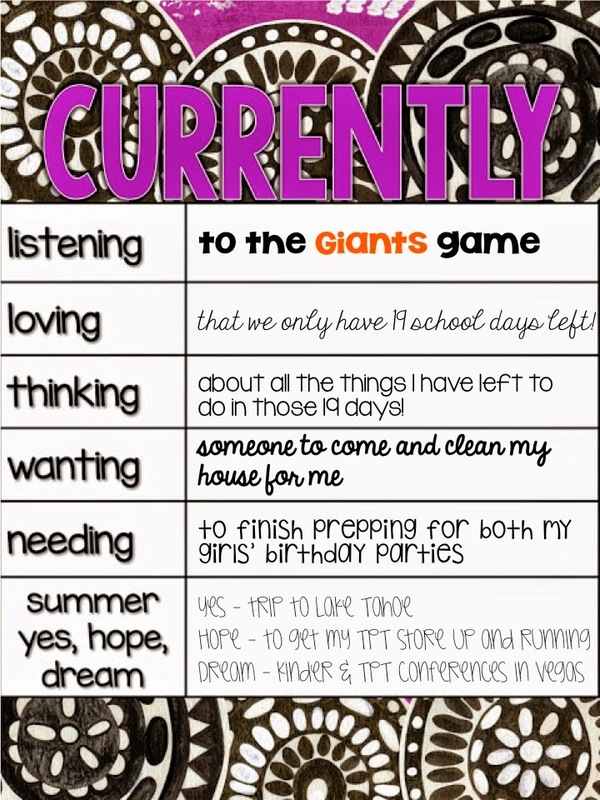 Thinking: I have so much left to do with my littles in the last few weeks of school! We have some big events including our Authors' Morning and Kindergarten Celebration at the end of the year. Not to mention finishing end of the year assessments and report cards. Blech. Needing: Both of my girls have birthdays in May. This was perfect timing when I was pregnant. I took the last month of school off, had the summer home with my newborn, and returned to school in the fall. I didn't really think ahead about how I would have to plan and host 2 birthday parties during one of the busiest months of the school year! Ha! Yes - Can't wait for our annual trip to Lake Tahoe. It's such a beautiful place to spend our vacation. Hope - Now that I've got this little blog rolling, I'm hoping to spend the summer creating and get some units posted to my little TPT store. Dream - I want so badly to go to Vegas to the I teach K Conference and the TPT Conference! Unless I hit the lottery some time soon, I'll have to just start saving my pennies for next year. Head on over to Farley's blog to check out who else has linked up! I just finished cleaning the floors and that was a major struggle, but a clean home makes me feel so much happier. Lake Tahoe sounds perfect! Congratulations on the Giants win! We have 19 days left, too. How did that happen? Good luck on planning those birthday parties! I'm so jealous that your Summer break is only 19 days away! It sounds like you've got some great plans for your holidays, though! I, too, will be dreaming of attending the conference. Alas, the distance and cost is a bit much for me here in Australia! And I totally hear you on wanting someone to come and clean. That would be SO useful! Welcome to blogging! I too would loooovveeee for someone to clean my house. It just seems like it's never ending, and don't get me started on laundry...lol!! My children's birthdays are together also. I liked the fact that I could deal with the parties then not have to think about them again for another year. Wow, that sounded bad, didn't it?